HydraFacial® is a multi-functional skin rejuvenation technique designed to improve the look, feel, and overall health of skin. This unique, non-surgical treatment works gently to remove impurities from the skin’s surface while providing nourishment to dry, unhealthy, and/or sun-damaged areas of the face. HydraFacial®’s innovative spiral-headed technology can restore skin health through a process of cleansing, exfoliation, and saturation of nutrient-rich antioxidants. The process is non-invasive, adaptable to every skin type, and can take as little as 30 minutes to complete. At our practice, the HydraFacial® treatment can be customized by board-certified plastic surgeon Tiffany McCormack, MD and our skilled aestheticians to deliver condition-specific serums to the face for personalized skin therapy and optimal results. Best of all, patients can often achieve an immediate, healthy skin glow in as little as one session, making this the perfect “red carpet” treatment prior to weddings, social functions, and other special occasions. What are the Benefits of HydraFacial®? Dr. McCormack, or one of our skilled aestheticians, can help determine which serum would be most effective for the health of your skin in a consultation prior to this skin treatment. Whether you have signs of aging you would like to address, you wish to restore your skin to an even tone, or you simply seek to make your skin more vibrant, HydraFacial® can be a convenient and effective solution to your skin care needs. What is HydraFacial® Treatment Like? 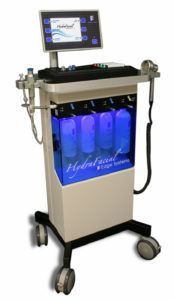 The HydraFacial® treatment works in three steps. First, the rotating spiral head exfoliates dirt, debris, and dead cells from the surface of your skin to provide a deep cleansing that reflects more light, making skin look healthier and more vibrant. Next, impurities are loosened from pores and gently suctioned out, discouraging the formation of blemishes such as acne. Finally, unique serums are saturated into your skin to deliver vital nutrients, providing a comprehensive, even rejuvenation. After treatment, there is typically no irritation or downtime. If desired, make-up can usually be worn right away, and the restorative, reinvigorating effects of HydraFacial® should be immediately apparent. Additional treatments can be received until the desired outcome is realized. For most patients, one treatment per month can significantly improve skin health and prolong the results of HydraFacial®. Are There Any Side Effects From HydraFacial®? One of the many benefits of HydraFacial® is that most patients experience little to no side effects from this gentle method of skin rejuvenation. In some cases, men and women with sensitive skin may notice minor redness or irritation immediately after treatment; however, HydraFacial® typically doesn’t cause any of the inflammation commonly associated with other skin therapies. Still, selecting a qualified aesthetic provider or board-certified plastic surgeon to perform your treatment is essential to your health, safety, and appearance. How Much Does HydraFacial® Cost? The cost of HydraFacial® generally falls between $150 and $300 per treatment, although the price can fluctuate according to your geographic location. Fortunately, cosmetic treatment in Reno is typically much more affordable than the potential cost in coastal cities. At the M Spa, we offer patient financing options through CareCredit®, ALPHAEON™ Credit, and Prosper® Healthcare Lending. As some of the leading financial lending companies in the country, these reputable healthcare institutions can make it possible to pay for your treatment incrementally, as opposed to in one complete sum. Each of these companies offers flexible plans with low monthly installments and no-interest options, making it easy for approved patients to choose the best arrangement for their budgetary concerns. If you have any questions about the cost of HydraFacial®, please contact the M Spa today. For more information about HydraFacial, or if you would like to schedule a consultation, please do not hesitate to contact our practice today.